zMAX Dragway, the Bellagio of drag strips, is geared up to host the ninth annual NGK Spark Plugs NHRA Four-Wide Nationals this weekend, with fans from all 50 states and 11 countries in attendance to witness a unique spectacle of speed. The 10,000-horsepower machines will barrel down the dragway, four-wide, at speeds greater than 330 mph. zMAX Dragway's three-day showcase of raw power and blistering speed is like nothing else in sports. First time at an NHRA event? Go to Nitro School, where some of the biggest names in NHRA drag racing help novices become nitro know-it-alls. Nitro School is an awesome, fan-based experience where fans can learn the ins and outs of what they're about to witness. In Nitro School, NHRA first-timers can learn about things like engine teardown as well as what it feels like to go from 0 to 330 mph in less than four seconds. Class is in session at noon on Saturday at the NHRA display in Nitro Alley. Visit the NHRA Welcome Center for daily guided walking tours through the NHRA pits. Weekend schedules, maps and historical NHRA info will be available to help you navigate the NGK Spark Plugs NHRA Four-Wide Nationals. Try your hand at the prize wheel for a chance to win cool swag before taking one of the 30-minute guided tours at 3 p.m. on Friday, 1 p.m. on Saturday and 9:45 a.m. on Sunday. Fans can take in a unique display of vintage power with 1960s gasser cars, which are scheduled to make four-wide exhibition runs on Friday and Saturday after qualifying rounds. The engines in these throwback machines mimic those of a Top Alcohol dragster, but the cars have a short wheel base like that of a Funny Car. Check them out up close, just behind the John Force grandstands by the staging lanes, before they take to the track. For just $99, fans can upgrade their tickets to be a part of the Top Eliminator Club. The ultimate race day experience includes daily meal service, driver appearances, VIP gifts and more. Join fan Q&As and autograph sessions with drag racing superstars like John Force, Matt Hagan, Steve Torrence, NHRA legend Shirley Muldowney, and more throughout the weekend. Fans also receive access to a VIP rooftop viewing area, VIP parking and an exclusive Top Eliminator Club t-shirt. Nitro Alley is every fan's one-stop destination for all things entertainment. Grab the latest souvenirs, meander through dozens of interactive vendor displays or tour the sprawling, 27-acre pit area and get up close and personal with hundreds of high-powered race cars; it's the place to be. The best part: it is included with the purchase of any NGK Spark Plugs NHRA Four-Wide Nationals ticket. Fans can come together to enjoy a parade and honor those who serve as part of the NHRA's 2018 campaign to honor first responders. The First Responders Parade, part of Sunday's pre-race festivities, will honor brave first responders who protect and serve both at the track and in communities across the country. The parade will include vehicles from multiple branches of service as a patriotic lead-up to the opening round of eliminations. Pre-race fun, including the track walk, is scheduled to begin at 10:30 a.m. on Sunday. 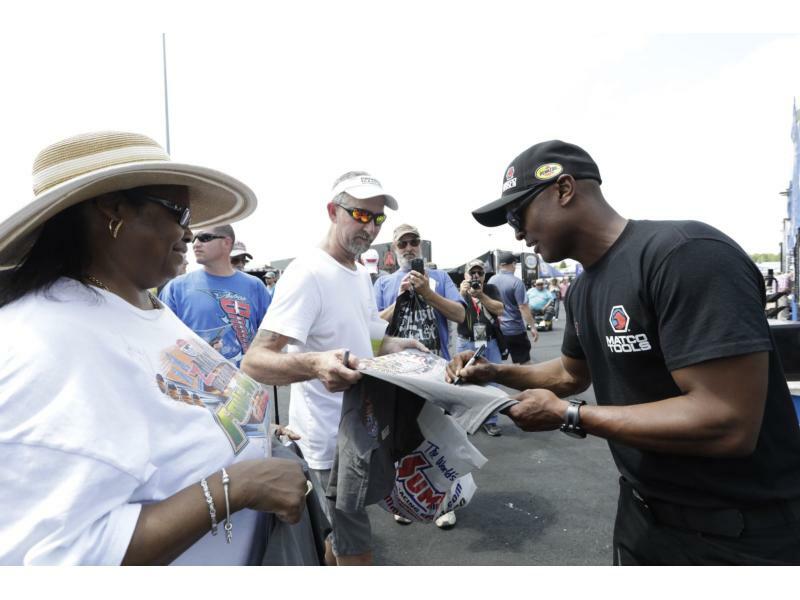 Fans with a Sunday ticket to the NGK Spark Plugs NHRA Four-Wide Nationals will have a rare chance to join drivers and drag racing personalities for the NHRA Track Walk Sunday at 10:30 a.m. Notable attendees include NHRA driver Richie Crampton, NHRA Legend Shirley Muldowney and NASCAR Camping World Truck Series drivers Matt Crafton and Myatt Snider. Just minutes before drivers take to the lanes for the opening round of eliminations, fans can walk the Bellagio of drag strip where history will be made as dragsters roar down the lanes four-wide. At the end of the walk, fans will be front-and-center for driver intros and opening ceremonies. No upgrade needed! Every NGK Spark Plugs NHRA Four-Wide Nationals ticket serves as a pit pass. It's like being in the dugout at a baseball game or on the sidelines of a football game. Fans are right in the middle of the action all weekend. Watch as cars are torn down and rebuilt after each run, take pictures with the sport's best drivers and teams and grab an autograph between lightning-fast runs down the strip. Celebrate National Superhero Day at zMAX Dragway on Saturday with a stop at the NHRA Welcome Center. Fans can pose as their favorite superheroes and even try on a zMAX Dragway cape for fun photos in front of the Wally selfie wall. Be on the lookout in the pits for some of your favorite NHRA superstars dressed as their favorite superheroes!